NST is a very gentle soft-tissue technique that works through the nervous system to bring about the auto-regulation and complete realignment and rebalancing of every tendon, ligament and facia tissue in the body. 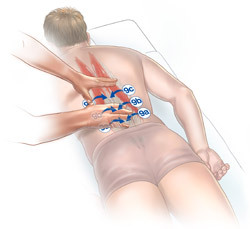 As the Connective Tissue System rebalances and restores alignment and proper tensegrity throughout the body, it, in turn, allows imbalances and physical stress to be removed so that bones, muscles, organs, nerves, arteries and veins can get back to proper placement, alignment and optimal function. A 3-year study on NST by the World Health Organization found that 85% of all participants had resolution of their complaints with only 2-3 sessions. The remaining 15% required a few more sessions for resolution. After resolution of the presenting issue(s) is acheived, maintenance is generally one session every 6-8 weeks. Weekly sessions are often beneficial for dancers & athletes in season, and also for those working through an intensely stressful period of life or life event. Attire: Plan to wear loose fitting clothing and simply remove belt and empty pockets, if necessary. This foundational work can help your body learn how to reboot itself so you can get back to living your life!